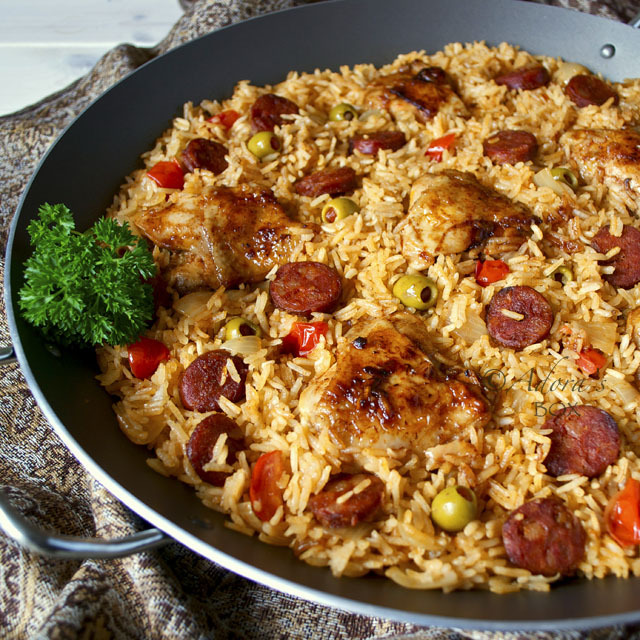 Legend has it that this recipe was born out of necessity, when a fisherman wanted to cook paella with the fish he had just caught. Unfortunately, he discovered that he ran out of rice grains. Finding fideua (generic word for pasta) in the cupboard, decided to use that instead. 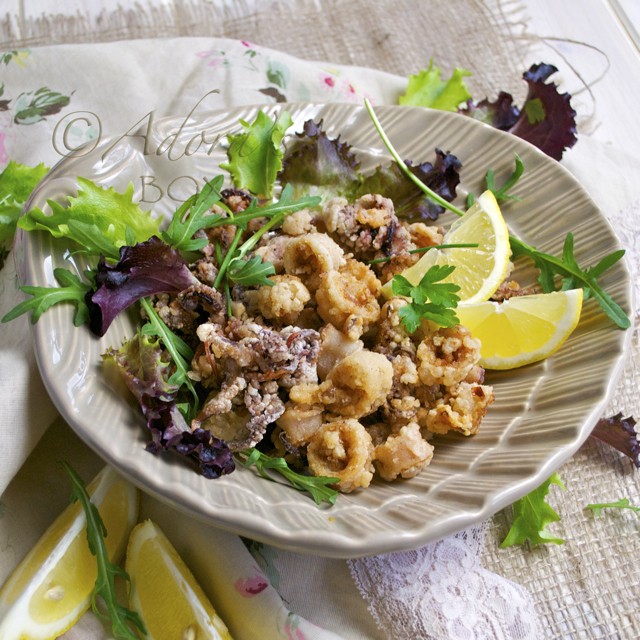 The new found accidental recipe was embraced by all and now occupies a prominent place in the Catalan culinary repertoire. 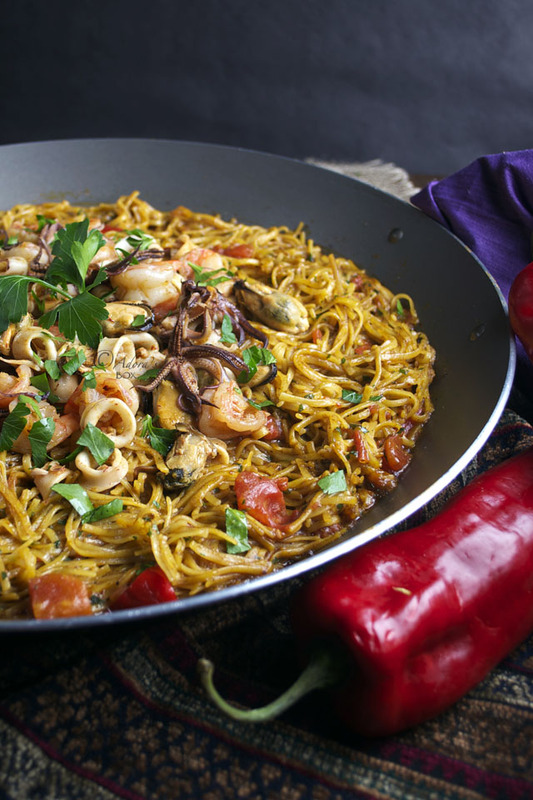 The dish fideua is actually the same as paella except for the main ingredient which is fine pasta instead of rice. I had my first taste of fideua on a recent trip to Spain. We had it at a busy seaside restaurant in Port Vell in Barcelona. My family enjoyed this dish so much that my son suggested that I post it here on the blog. It is not at all hard to make, I discovered. The most work done is in making the fish stock _ time consuming but not laborious. 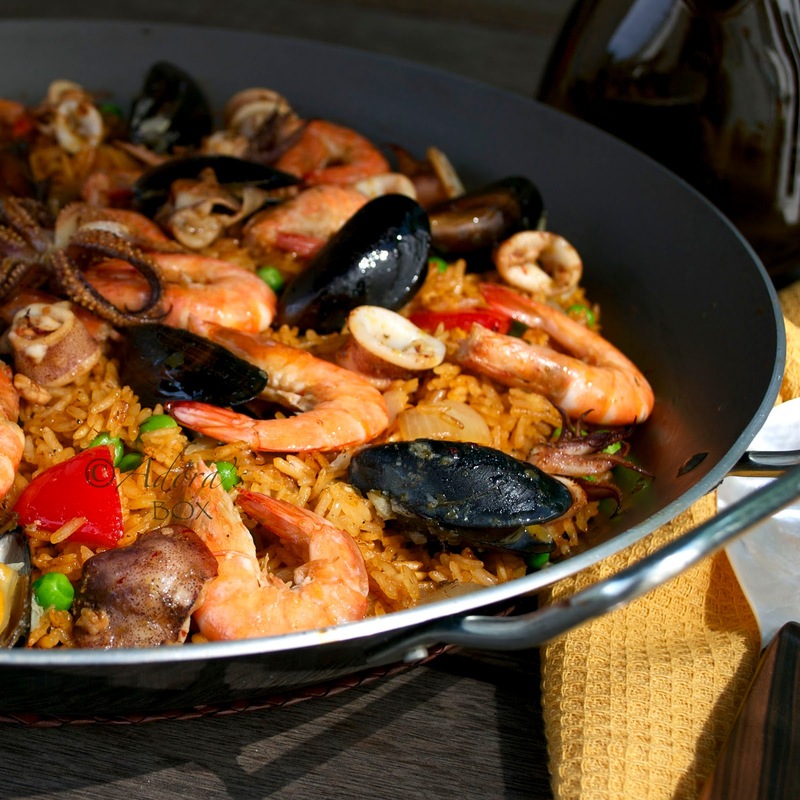 As with paella, the taste of the dish depends on the quality of the fish stock used. I used prawn shells and fish heads to make the stock. I fried the prawn shells and heads in a bit of oil first before putting it in with the rest of the stock ingredients. Onions, carrots, celery, parsley all lead to a very tasty stock. Simmer for a few hours if you can and you will be rewarded with the best tasting flavour base for your fideua. Any combination of shell fish and fish can be used. 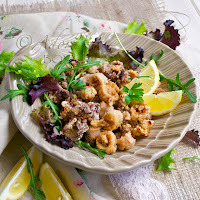 I used squid and prawns but you can add mussels and clams (reduce the amount of squid and prawns if you do). Heat up 1 tbsp. of olive oil and stir fry the prawns and squid until nearly done and transfer to a dish with a slotted spoon. They will still cook on after you take them out of the pan. There will be some juices left in the pan and that can be added to the stock. Heat up 3 tbsps. of olive oil, and saute the garlic for 1 minute. Add the pasta, saffron and parsley and stir fry for 2 minutes. 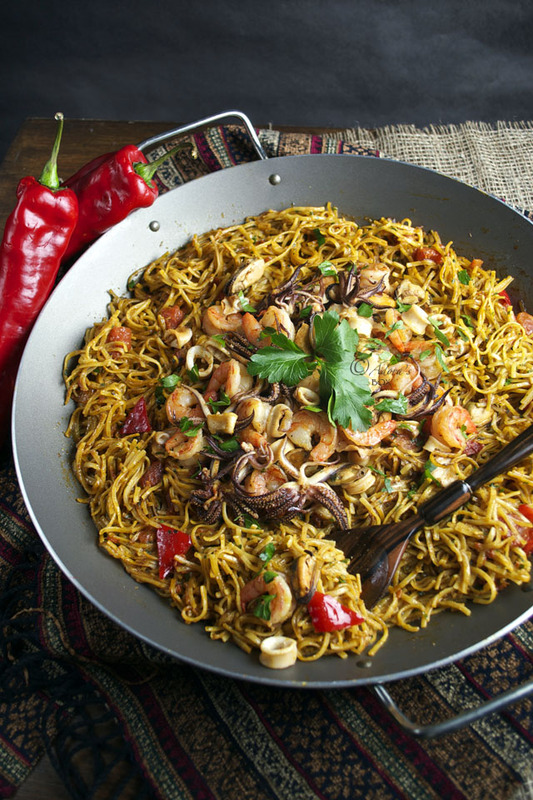 Add all the rest of the ingredients, except for the prawns and squid. Stir until well mixed. Check the seasonings at this stage and make sure it is right as this will be the last time you'll stir it. Cover the pan with a lid or with foil and simmer on very low heat for 10-20 minutes, depending on the thickness of your pasta. I used angel hair pasta and it was done in 10 minutes. Have a little peek after ten minutes. You may have to add more stock if your pasta is not done yet and the pan is nearly dry. 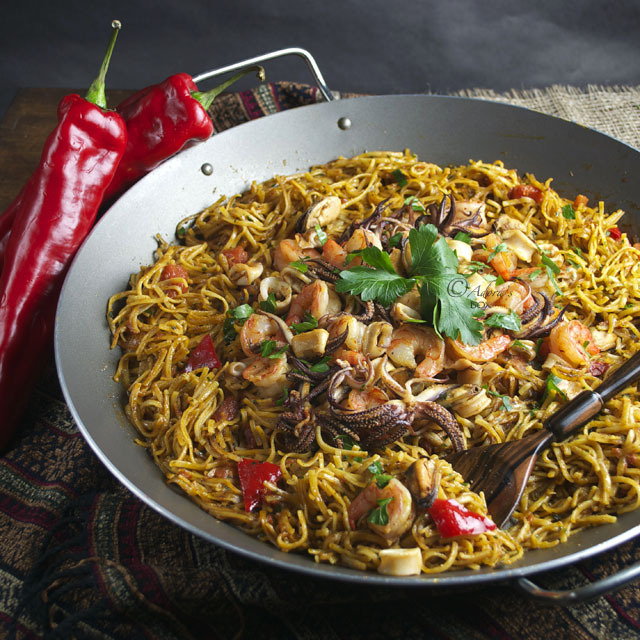 When the pasta is done, turn the heat off, arrange the cooked squid and prawns on top of the fideua and cover with the lid or foil. Let stand for 10 minutes before serving, by which time the squid and prawns would have been heated and their flavours infused into the pasta. Serve with pride. Hi, First I visit to your blog and I found the great recipe, thanks for share your recipe. I love this dish and it looks like you really aced it...the secret, you're right, is building the flavor from the broth. this is my first time to comment over here but i've been admiring you from the sidelines, esp when jojo shares your link. I am a fan of yours... keep blogging and thank you for sharing your culinary adventures. This dish looks so scrumptious. I would love to try it! Looks delicious! have bookmarked this to make at a later date! Thanks for sharing! What a beautiful dish! I never thought of paella substituted with something for the rice. no chicken? in colombia, paella always has chicken, even the seafood one.